Our students are overwhelmed with the amount of work piling up now. Long-term projects are coming due. Senior thesis deadlines have arrived. Presentations crop up in many courses. Finals loom. At the same time, students are distracted. Spring has sprung. Year-end parties are being scheduled. Students are searching for jobs, internships, experiences for the summer. It’s not surprising that they are finding it difficult to focus on writing those papers, moodle posts, problem sets. We are all getting bombarded by requests for extensions on assignments. Many of us are really understanding and so will fairly readily grant an extension of a day or two or maybe even longer. I mean, face it. Our grading workload is so heavy right now that having a few assignments trickle in later will make no difference. We won’t get to grading it anyway. What’s the harm? There may be no harm. For students who have had no difficulty keeping up with their work, a short extension on an assignment can help them get back on track. These students are managing their workload. It’s kind of like they are good jugglers. Their lives just threw in two more of those juggling pins. Maybe they falter for just a moment. But, pretty soon they’ve got all the pins back up in the air in a smooth arc overhead. But some students are really not skilled at juggling. They have perpetually struggled with multiple assignments. The little extension that you tend to give them on every assignment could just contribute to an impending avalanche of work that could overtake the work-weary student. Before you just say yes to that simple seeming respite of a day or two, ask your student what other work is coming due that week in the other courses. Have a conversation about his/her workload. What are you to do if it turns out an avalanche is happening? The fact is that ALL students have a huge workload right now. 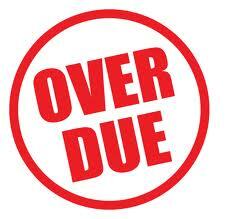 Most of the assignments have been known about forever and so students should be budgeting their time. If you say yes to one student because of workload issues, perhaps you should give the entire class that same extension to be fair. An extension will only result in a log jam further down the river. There are a few strategies for extensions that seem to be effective for those students who are relatively good at juggling, but who get overwhelmed as the semester moves towards the end. 1. Include a policy in your syllabus of “grace days.” Students can use these in a proactive way throughout the semester. The best jugglers have already planned on using the grace days for your course based on careful planning about the assignments they have in all their courses. Unfortunately, the students who struggle probably used them up weeks ago. 2. Talk with your class a few days before a big assignment is due and have a class vote about a short extension. Many students will greet the short extension (no longer than a week) with tremendous relief. There are always a few students who will not be happy with the extension because the new deadline will interfere with other work coming due. For those students, I usually suggest they stick by the original deadline. 3. You can have a policy of having students ask for extensions, with an explanation, in writing more than 24 hours before a due date. When I have this kind of policy, sometimes up to a quarter of the class will ask for an extension (usually with an email exactly 24 hours before the due date) on any given assignment. 4. Some professors do not allow late work except in cases of illness supported by a doctor’s note, or in cases of extreme emergency supported by a note from the Dean of Studies office. The Dean of Studies office sees a big increase in student visits as major assignments come due at the end of the semester and during midterms. I feel quite conflicted about extensions. Part of me (a pretty big part of me) feels that students need to learn how to manage their time. They need sometimes to learn that there are consequences for their lack of engagement. That time management takes discipline. On the other hand, I want my students to be able to do their best work. That academics is not about meeting deadlines. It’s about learning, writing, reflecting. I also feel a lot of sympathy for the struggling student and don’t want my course deadlines to be causing them undue stress and worry. I don’t want to be the bad guy. So, I have a policy in my syllabus. I sometimes talk with the class and give an extension to the entire class. I most often take things on a case by case basis. Some need a firm deadline, a line that cannot be crossed with additional extensions. Some need to just move on. I think the worst kind of extension for these students is the “just get it in when you can” statements that some professors make. 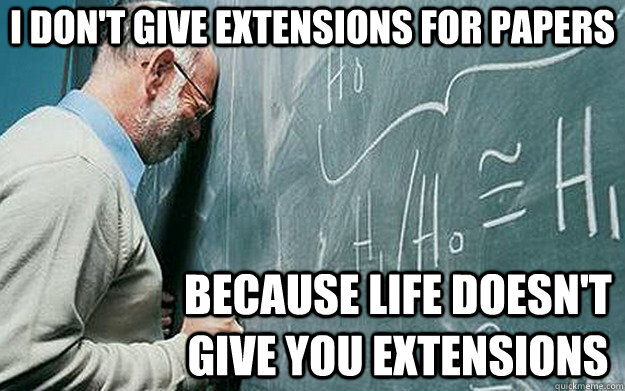 Students with these kind of extensions will continue to put other work (or other distractions) ahead of that assignment and, pretty soon, a whole stack of work for that course has piled up. This is not a good learning environment. To have to try to write three or five papers all in the span of the final week or two of the semester. This does not help the student. In fact, it can cause great harm. Are there policies or strategies that you employ that you find successful? This entry was posted in college teaching, Example assignment, Life as a Professor, motivation to learn, science education, Syllabus content and tagged college professor life, Giving college advice, Study advice, syllabus by Kathleen Susman. Bookmark the permalink.